Apple is just weeks away from unveiling the new iPhone 7 (or will it be the iPhone 6se??? ), with one highly controversial change: it’ll be shipping the handsets out sans headphone jack. Not so much a rumor as it is an unconfirmed reality at this point, removing the 3.55mm headphone port means those of us with expensive headphones or earbuds are SOL -- including, it turns out, Apple's co-founder Steve Wozniak. In an interview with The Australian Financial Review, Wozniak waxed poetic about his cushy earbuds, which are custom ear implants that "fit in so comfortably, I can sleep on them and everything. And they only come out with one kind of jack, so I'll have to go through the adaptor." We feel your pain, Woz. Apple's decision will undoubtedly result in a ton of tossed electronics (not so great for the environment), forcing consumers to dole out cash for new Bluetooth headphones or clunky adaptors. 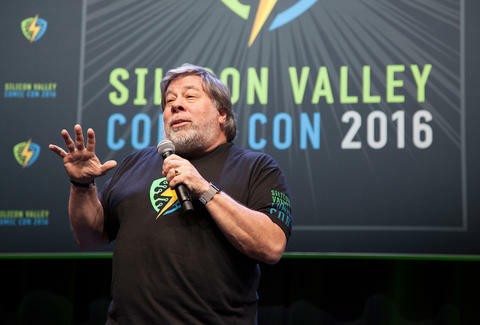 "That's going to tick off a lot of people," said Wozniak. Indeed, The Verge called removing the headphone jack "user-hostile and stupid." There's even an online petition over 300,000 signatures strong to #SaveJack, and we certainly have our own list of demands for the new iPhone 7. Wozniak's complaint about the switch to wireless is specifically one that music fans will relate to: the sound quality just isn't the same. "I would not use Bluetooth… I don't like wireless. I have cars where you can plug in the music, or go through Bluetooth, and Bluetooth just sounds so flat for the same music," he told AFR. Ultimately, Woz threw some shade at his former company, which he co-founded with BFF Steve Jobs and left in 1985: Apple either needs to step up its Bluetooth game or keep the jack. "If there's a Bluetooth 2 that has higher bandwidth and better quality, that sounds like real music, I would use it. But we'll see. Apple is good at moving towards the future, and I like to follow that." Keller Powell is an editor at Thrillist and would like to remind everyone to please responsibly recycle your earbuds when the time comes.